NATO airstrikes near the oil city of Brega (Marsa al-Buraiqa) on Tuesday morning repelled the advance of an 8-vehicle military convoy of Qaddafi loyalists. The Transitional government in Benghazi is eager to gain control of Brega, from which they were pushed back on Monday night, because they could then export petroleum from it under a deal they have done with Qatar. The significance of the strike on the convoy is manifold. Qaddafi doesn’t have infinite amounts of heavy military equipment, and every tank or armored vehicle he loses degrades his ability to control a country that for the most part doesn’t want him. When urban crowds and rebel forces have faced Qaddafi loyalists and both have just had light arms, the rebels have typically prevailed. NATO estimates that 30% of Qaddafi’s military capacity has been knocked out. 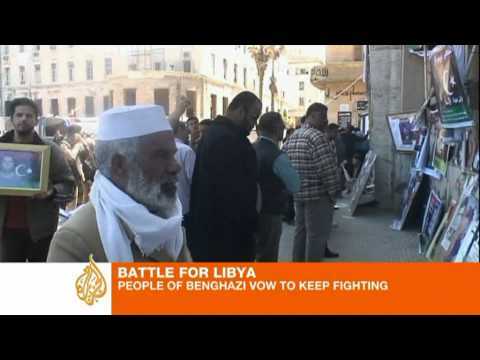 It is now concentrating on rescuing Misrata, the country’s 3rd largest city, which is under a tank and artillery siege. Qaddafi’s use of camouflage and human shields is making the targetting difficult for the UN-authorized bombing missions. Another significance of the strike is that it may well discourage soldiers loyal to Qaddafi from trying to attack the rebels, and may encourage them to defect to the Benghazi government. So far the NATO strikes on Qaddafi convoys have been intermittent, and so many commanders may have thought that the risks are bearable. But if the strikes become more consistent they will likely take a psychological toll. The pro-democracy government in Benghazi are sending off $100 mn. worth of petroleum from the eastern city of Tobruk, with a Liberian tanker expected to arrive Tuesday. If the struggle is protracted, control of petroleum resources will be key to the reform government’s victory over Qaddafi loyalists. If they can regain control of Ra’s Lanuf and therefore of the Buraiqa basin, they would have the bulk of oil resources on their side of the country. Qaddafi would still have natural gas, but it is not clear that the United Nations will permit him to export it, and gas is harder to smuggle than is petroleum. Time reports unconfirmed information that fighting has resurged in Zawiya, the western port that threw off Qaddafi rule in February and early march before being brutally reoccupied by tank brigades from Tripoli. Qaddafi’s spokesman admitted on Monday for the first time that civilians were killed in the taking of the city. Qaddafi’s forces are still shelling the city of Zintan, southwest of Tripoli, but it has apparently held out. The Zintan tribe declared against Qaddafi, and has desert networks that allow it to offer aid to the continued, now-underground resistance in Zawiya, keeping it alive. The sort of indiscriminate tank fire on civilian areas practiced by Qaddafi on Zintan is a war crime that he may well end up being tried for at the Hague. Italy has recognized the Transitional government in Benghazi, rebuffing a proposal from Tripoli that one of Qaddafi’s sons preside over a transition to a new government. The Italian foreign minister called the Qaddafi offer ‘not credible,’ which is almost certainly true. The Benghazi government also rejected the overture and called for the Qaddafis to leave the country. In other news, The Fateh Party in the West Bank has launched an investigation into charges by the Benghazi government that its ships had intercepted a shipment of Israeli arms intended for Qaddafi’s forces, in which Palestinian figures were implicated, including Muhammad Dahlan.